This gorgeous 4 Bed 3 Bath Town Home is spacious offering large 1st floor king-bed master with large bath and closet. Brand new electronics with large flat screens in living room and master bedroom. Cable with ESPN, Movies, and WiFi throughout. Upstairs has 3 bedrooms with large closets (2 queens and 1 full). You will love the privacy and view. Conveniently located in a safe neighborhood with access to the Galleria and Summit shopping and just minutes to UAB and Samford University. Only 10 minutes from the Hoover Metropolitan Stadium, home of the SEC Baseball Tournament. This property is surrounded by several great upscale and fast food restaurants. 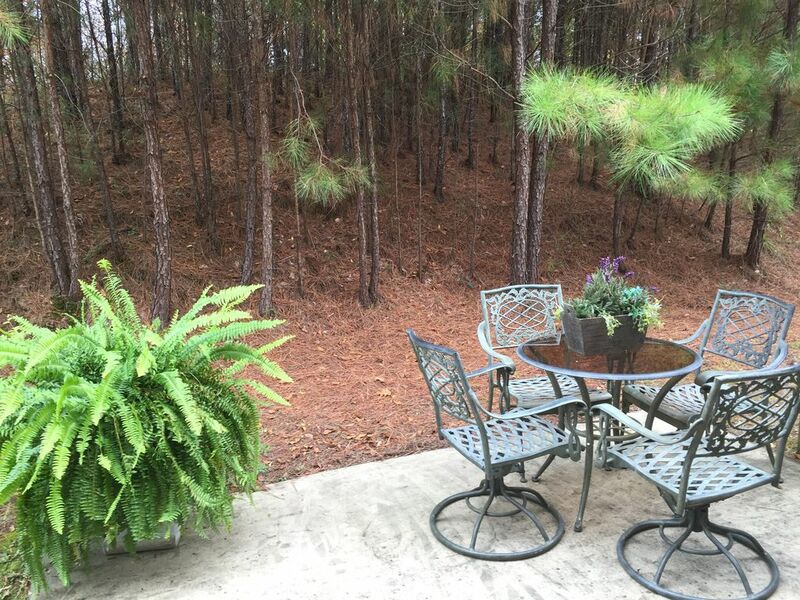 Whether you are looking for a great get away to Birmingham or playing the Robert Trent Jones Trail, you will love this townhouse! We are seasoned travelers who designed this town home for those who want a break from hotels but want access to luxurious accommodations. After traveling to Alabama for a few years to visit college aged children we purchased this spacious town home due to desire to avoid another hotel room and lack of satisfaction with other rentals. After moving to Birmingham and purchasing a home earlier this year, we kept this beautiful town home as a furnished rental. This property is just minutes to the Galleria and Summit Shopping and is surrounded by several great upscale and fast food restaurants. Travel to UAB and Samford is less than 10 / 15 minutes. Ross Bridge and Oxmoor Valley RTJ courses are 15 and 20 minute drives. Tuscaloosa is less than 1 hour away and Auburn university is approx 2 hours. The privacy and view out the back is what you expect Alabama to be. Dining table expands with table leaf in closet. We had so much fun and the place was perfect . Clean, well located, charming and had everything we needed. Highly recommend to anyone. I am part of a group of four college buddies that get together once a year for a golf week. We decided to try the Robert Trent Jones golf trail this year. This property was perfect for us! Having four bedrooms at this price was tough to beat. The first floor layout was nice and open, perfect for relaxing after a day of golf. The property owners, Tami and Mitch were very responsive and gave us great ideas where to golf and eat in the area, which was a positive add to our experience. We had a great stay at this very comfortable, 4 bedroom townhome! Our company had a National convention in Birmingham & this was a great place to have members of our team stay together in one location. Beautiful home! We enjoyed staying at this home over Christmas with our daughter, son-in-law & 2 year old grandson. It was much nicer & more comfortable than staying in motel rooms, especially with a baby. We would be happy to stay here again. great condo! would recommend highly. very clean and convenient to shopping, restaurants, etc. You should try this Town Home if you are passing through this area. Great to have you Steven! Come back and see us again!